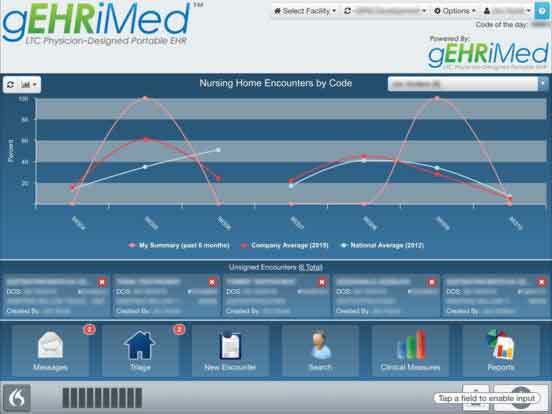 The GEHRIMED MIPS Dashboard provides administrators and providers with the ability to track the total MIPS composite score based on information entered into GEHRIMED. Additionally, Scorecards display the progress in each of the 3 MIPS categories: Quality Measures, Promoting Interoperability (previously known as Advancing Care Information), and Improvement Activities. Additional details about this feature are available in the MIPS Education area of the GEHRIMED Online Community. Additional Quality Measures are now available. Please contact Client Services if you would like these enabled. The Primary CPT is now included in all Encounter search results, regardless of whether the CPT Code was used in the search criteria. When Change Criteria is used to select a different patient on an unsigned encounter, any Patient History items (such as Past Medical History or Room number) that were populated in the encounter for the original patient and have not been modified are re-populated with the Patient History of the selected patient. When an addendum is added to an encounter, including those added through the use of Change Criteria, the encounter title is modified to notate that the encounter has been amended. For example, PROGRESS NOTE (AMENDED). Change Criteria no longer allows the patient to be changed on a signed encounter. Additional validation has been applied to Change Criteria to improve record locking during simultaneous user access. In the Directory, additional Specialties are now available. Additional validation has been added to the Directory Listings so that a fax address which has been added to a facility as an additional delivery recipient may not be deleted. To delete the address, first remove it from the facility delivery recipients. The Facility column has been removed from Patient Detail Triage notes list and in the Triage view. Manage Users has been improved to load and search faster. Results are displayed in a paged list. A new encounter item option is available for encounter templates so that the Previous values for an item are visible, but cannot be brought into the current encounter. The Encounter Header configuration now includes an option for formatting the patient’s name to include the middle name. The Format options used to set the text style for an encounter item was not applying the selected formatting to the text. Fixed. For some users with “Read Only” GEHRIMED access, the Patient History tab on Patient Detail did not show a label. Fixed. Patient Portal users were not able to complete the process of resetting their password using the configured security question. Fixed. Clinical Summaries downloaded from the Patient Portal required password encryption of the compressed downloaded file. Fixed. When a new encounter was created from Patient Detail, upon returning to Patient Detail after the encounter signature, the Patient History items on Patient Detail were not editable. Fixed. View Deliveries was not properly refreshing when a user clicked the Ignore or Resend buttons on a failed fax delivery entry. Fixed.